Abortion activists are at it again, attempting to introduce bubble-zones around New South Wales abortion facilities. As stated many times on this website, these so-called ‘safe-access zones’, also known as exclusion zones, are designed to stop advocates for life from offering assistance to desperate women who feel pressured to abort their children. They also hamper the freedom of political communication which should exist in a free society like Australia. They also hamper the freedom of political communication which should exist in a free society like Australia. Exclusion-zone law, very similar to that being proposed in New South Wales will be under the scrutiny of the High Court of Australia this year due to our legal challenge. Any politician who is realistic about the fiscal and time constraints that apply to our parliamentary system wouldn’t dream of introducing legislation that has a constitutional cloud hanging over it. How foolish, then, to try and have another potentially unconstitutional law passed – are abortion advocates so desperate to ensure that every baby marked for extinction will make it into the abortuary without its mother being given one last opportunity to change her mind? Even some politicians are beginning to wonder if the exclusion-zones they voted in are really a good thing. For example, the Hon. Neale Burgess of Victoria has announced in the chamber that he has changed his stance on abortion facility exclusion zones. On another important matter, I would like to put on record my change of mind on the government’s exclusion-zone laws. At the time the bill was debated I found the argument for keeping people with different views on such an emotional topic separate compelling, but my training as an officer of the court has prevailed in circumstances where my conscience should have. After discussing these laws with a range of people, including Kathy Clubb, it has become apparent to me just how damaging these laws are. A video from 2016 was released this week by Channel 9, which advocates claim confirms the need for exclusion-zones near abortion facilities. The video shows a violent altercation between a member of the Helpers of God’s Precious Infants and a man who had taken his partner to have their child killed by an abortionist. 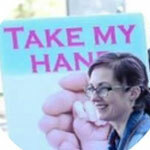 Police were called, and the pro-lifer was arrested and charged – under a law that already exists in NSW. Something that people should be aware of: Channel Nine portrayed the man attending the abortion mill to kill his baby as “an innocent young man waiting for his girlfriend inside.” Nothing could be further from the truth. He was outside smoking when we arrived and his girlfriend was already inside. He immediately commenced a calculating and persistent stream of abuse, harassment, intimidation and vulgarity against the Helpers especially me. He made threats which prompted me to call the police who attended and spoke to him and told him not to come outside the place and not to engage with us further. They told us he would be ok now, and that he was just upset by what was happening inside. We told them he had said to one of our members whose fiance was across the road, “What if I f**k her and stuff her up?” and many other “unpleasant” things. They assured us he would be ok now that they had spoken to him. They hadn’t even driven off when he was out again and haranguing me with the same unpleasantries. The incident shown by Channel Nine grew from that. If the police had done their job in the first place, that would have been the end of it. Our guy did the wrong thing for sure. But he was arrested and charged and it went to Court. In other words they didn’t need “safe access zone” laws to act! ‘Safe-access’ laws penalise pro-lifers who are only there to help women. So while it may be tempting to use this incident as proof that a new law is needed, critics of sidewalk advocacy need to think very carefully about the reality of activity both inside and outside an abortion business. In the article mentioned above, NSW Premier, Gladys Berejiklian, states that she ‘condemns violence in all circumstances.’ Presumably, Ms Berejiklian also condemns the violence involved in an abortion procedure, when an innocent child is dismembered in utero. Please join Australia’s pro-life community in drawing attention to the injustice of these censorship zones, using the hashtags #WeSupportWomen and #NoToCensorship. You can learn more at the We Support Women website and Facebook page. And if you live in NSW, contact your local MP to urge him or her not to support this unjust law. Labor’s Penny Sharpe and the Nationals’ Trevor Khan teamed up to co-sponsor the bill.